Tropical cyclone (TC) prediction and impact of warming environment on cyclonic activity are one of the most popular research topics. Based on sea surface temperature (SST) anomaly variation, the period 1880–2015 is divided into pre-warming (PWP; during 1880–1946) and current warming (CWP; during 1947–2015) with negative and positive anomalies respectively. Based on data availability, the period 1891–2015 is emphasized for the analysis of variability in TC climatology. The Mann-Kendall test and Sen’s slope estimation indicates a clear decreasing trend in annual TS (total storms) and CS + SCS (cyclones and severe cyclones) frequency during CWP for NIO region and particularly Bay of Bengal (BOB) at 95% confidence level. However, the TS and CS + SCS frequencies were increasing during the PWP. TC activity over southern and northern BOB is decreasing sharply during CWP. Southern sector of BOB hosts mostly severe systems and middle sector most TCs. TC activity over the eastern sector of Arabian Sea shows considerable enhancement during CWP. 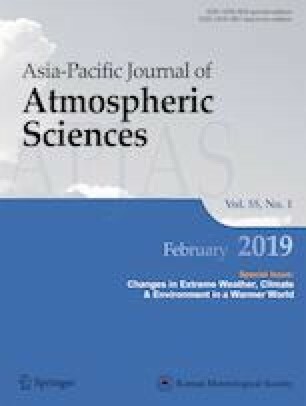 An increasing SST, surface wind, mid-tropospheric relative humidity and potential evaporation factor (PEF) are helpful in the formation of intensified storms during CWP. The activities during PWP were reverse compared to that of CWP. A large temperature anomaly difference between atmosphere and Ocean also perceived to play a key role in modulating the enhanced intensity of TCs during CWP. The SST range of 27.5 °C to 29.5 °C and supportive flow field is helping to enhance the middle and upper tropospheric moisture content; eventually, resulting in increased SST, PEF and relative humidity through a possible feedback mechanism. The online version of this article ( https://doi.org/10.1007/s13143-018-0069-0) contains supplementary material, which is available to authorized users. A correction to this article is available online at https://doi.org/10.1007/s13143-018-0098-8. The authors wish to acknowledge IMD (www.rsmcnewdelhi. imd.gov.in), ICOADS (icoads.noaa.gov), ISRO/NRSC/Bhuvan (bhuvan.nrsc.gov.in), IBTrACS (www.ncdc.noaa.gov) and NOAA/CIRES (www.esrl.noaa.gov) for their data support for this research work. The sincere thanks are also to Mr. Sunny Kant and Mr. Sundhansu Sekhar Rath from National Institute of Technology (NIT) Rourkela for their technical helps while carrying out the work. We also wish to thank Krishna K. Osuri (NIT Rourkela) and anonymous reviewers for their input, which helped to improve the manuscript in all directions.